When I was very young, in the mid 50s, our little family lived in the suburbs of Detroit Michigan. One day we were driving to visit some relative. Just a few miles from our home, I saw trucks with several large white missiles in a grassy area I had thought to be a park. They were being installed in underground silos. This was quite an "other wordly" experience for an 8 year old, and probably not an experience that too many people have had. Even at that age I knew this was an "ominous" sign of some sort, but it was only a few years later that my fifth grade teacher explained that if there was a nuclear war, Detroit and all the way out to the suburbs would all be one large fireball. He explained this to make his point that the drill we had to do, of tucking ourselves down underneath our desks, was pointless. That era and those kinds of facts and fears spawned some interesting toys and emergency items. I do not remember seeing these products while growing up, but I came across the following missile truck toy recently at an online vintage toy shop. Did anyone think it was cute to watch their children play with a truck loaded with ICBM missiles? I do recall all the fuss about building bomb shelters. Everyone was talking about it, though I did not know anyone who had one. 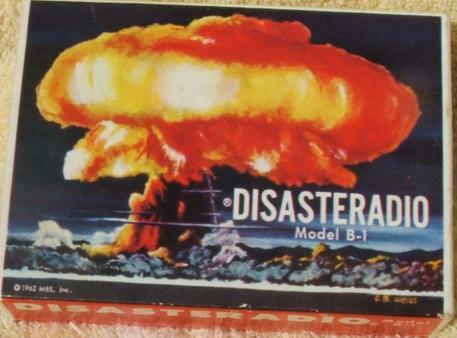 A few months ago, I saw for sale on eBAY, a product called a "Disaster Radio". At first glance I thought it too was a toy, but I was wrong. 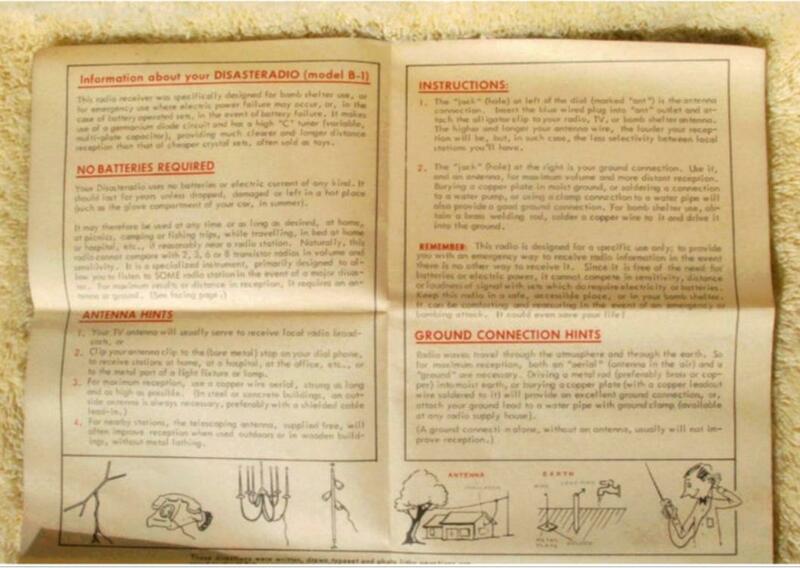 This was intended to be kept inside your underground bomb shelter. Take a look at these images. 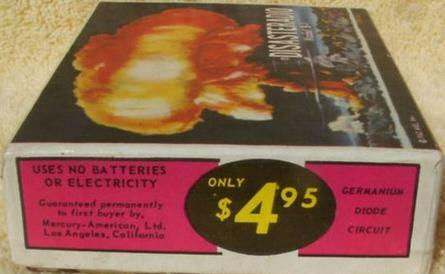 Hey it does not use batteries and has a state of the art Germanium Crystal Diode too! More good marketing. Germanium, one of those fancy new semi conductor things! 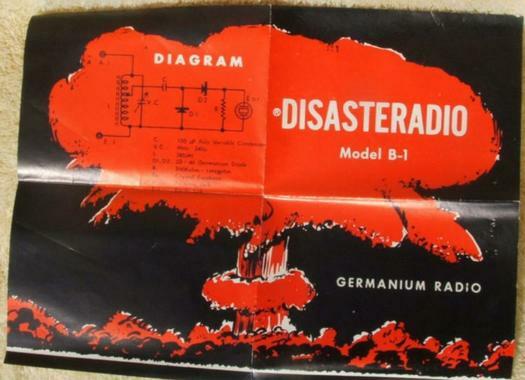 I wonder how many of these bomb shelter radios they sold. This is a simple crystal radio set. Imagine the irony of this simplest of radios being your means of communication from your bomb shelter after the most advanced technology bombs are the reason you are confined to this underground prison until or IF the radiation clears. 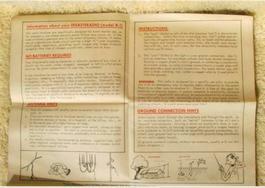 Click on the instructions for a larger image. And this picture below shows what you got for your $4.95. This toy-like plastic crystal radio might well be your only link with the outside world. 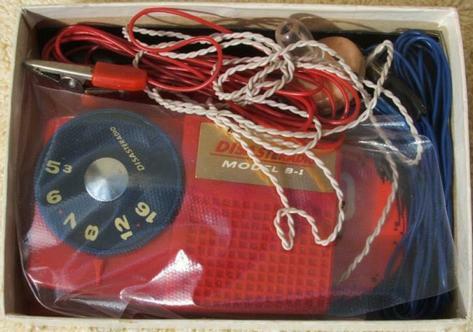 Somehow, looking at this red plastic radio does not comfort me when I think of those large white missiles I saw them installing in underground silos a few miles from my home. I am picturing a husband and father all excited about getting one of these for his bomb shelter while his wife looks at the red plastic radio and then looks at him as if he is crazy. But I still wonder how many of these they sold.